Overcrowding – a question of more trains? Posted 14th September 2012 by paulhollinghurst in Advice, Overcrowding. Our national rail network is carrying more and more passengers, with growth of several percent per year. Inevitably, this leads to problems with overcrowding – and a great deal of frustration amongst passengers who are left standing. While it doesn’t change the fact that you can’t get a seat, sometimes it helps to understand what the reasons for overcrowding are. FixMyTransport is great for finding out what caused the problem, and provides a way of seeing if anyone else if having a similar issue, which strengthens the case for sorting it out. Frustratingly for anyone running a campaign, information about train overcrowding is treated as commercially confidential by the rail operators and Department for Transport (DfT) – so it’s not available even through a Freedom of Information Request. Providing such data would give passengers a much better idea of what was happening, and would allow us to make informed decisions about which services to avoid. Unfortunately, secrecy prevails, though some operators do give information about which services are expected to be busy. So, if operators are aware of the overcrowding, and it happens all the time, but there are no current plans to fix it, then what can be done? It really comes down to persuading the Government and the Department for Transport to make some changes. Routes are run by operators on a franchise basis – and those franchises are just a few years in length. Carriages typically cost between £1m and £2.5m each, and have a life of 40 years, so investment decisions are not trivial. Many operators may look at the short time remaining on their franchise, and make the decision that there is no point in sinking that kind of money into rolling stock. One solution would be an agreement that any trains purchased would be used in the next franchise to justify the investment. A particularly influential time is in the consultation period before a franchise is re-let. The current set of consultations are listed on the Department of Transport website. Passenger satisfaction on issues such as overcrowding will be more important in future; the recently awarded InterCity West Coast franchise promises “for the first time in an intercity franchise, better customer satisfaction as measured by the National Passenger Survey”, and there have also been resultant calls for more transparency in the franchising process. 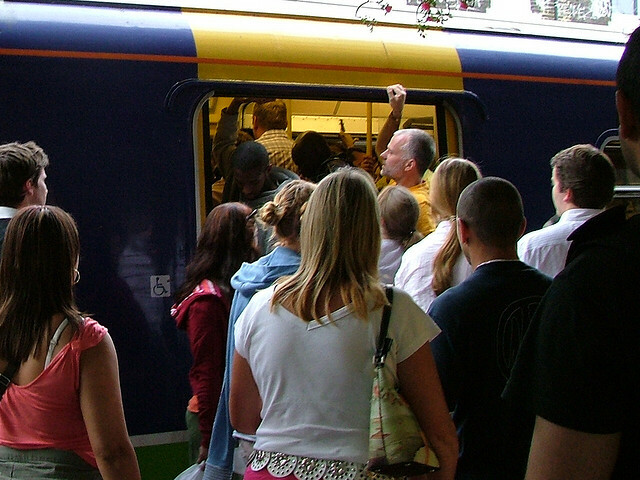 As a passenger who is squashed like a sardine into your train every morning and night, it may not seem particularly useful to know the high-level reasons behind your route’s overcrowding: the temptation might be to give up and find an alternative method of getting to work. But we built FixMyTransport to help with huge problems as well as little niggles. What if everyone in your carriage signed up to your FixMyTransport campaign? 50 names are harder to ignore than just one. And we have built-in functionality that allows you to contact the people who can make a difference to your campaign. Your MP will have some influence over these decisions, or you could support a local rail users group in pushing for improvements. Once you know the reasons for the overcrowding on your route, you’re in an excellent position to gather support and press for change – and we’ll help you all the way.